Davao City, the hometown of President Rodrigo Duterte where he was mayor for decades, is known for safety and discipline. Now, it can also boast as one of the pioneering cities where the government’s ambitious taxi modernization program is being rolled out. A key element of the modernization scheme is for taxis to be equipped with ride-hailing apps so they are accessible via smartphones to customers, improving transparency, efficiency as well as public safety. At least 4,000 cabs in Davao City are part of an online ride-hailing network, allowing commuters to use their smartphones to search and book taxi rides. With these ride-hailing apps, it’s possible for taxi passengers to find out the brand and plate number of the cab that will pick them, along with the name and even picture of the driver as well as estimated cost of the ride. In Metro Manila, these amenities are mainly available to users of ride-sharing networks Grab and Uber (before the latter was acquired by the former in April), which consist largely of private cars. Except for very few taxis that are part of the Grab transport network, most cabs in Metro Manila and other urban centers are not equipped with ride-hailing apps. One reason why thousands of cabs in Davao are accessible via smartphones is because of Hirna Mobility Solutions, a tech startup that developed an app called “Hirna” especially for the city. 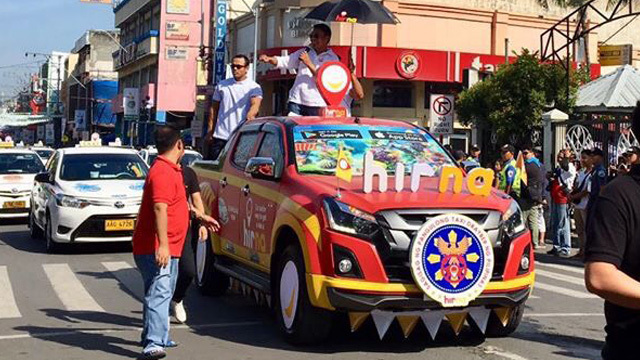 Co-founded by Francisco Mauricio, president of the Philippine unit of global car rental company Avis, and Sherwin Chu, a computer programmer, Hirna worked with the office of Davao Mayor Sara Duterte and the Metro Davao Taxi Operators Association (MEDATOA) under the guidance of the Department of Transportation (DOTr). The result is a ride-hailing service that charges no booking fees or surge prices. Passengers only pay for the metered fare. Hirna also comes with in-app messaging and hotlines to the Land Transportation Franchising and Regulatory Board (LTFRB). There is also a 24/7 customer service support to assist all passengers, including those without smartphones. The call center is particularly useful in Davao City, where smartphone penetration is still quite low in certain passenger demographics. “Hailing by phone call is still prevalent here in Davao. Many households still call taxi operators to make a booking and then wait for the cab to arrive at their doorstep,” said Aron Sapasap, a taxi rider who has used the Hirna app at least three times since its beta version became available in February. The LTFRB’s taxi modernization program is an ambitious plan to improve transparency, efficiency and public safety of both users and drivers of cabs all over the country. To push taxi operators to invest some money to upgrade the quality of their service, the LTFRB approved the cab operators’ long-time petition for a fare hike in November 2017 but made the implementation of the increase contingent on a number of conditions. Among these conditions is that cabs must be equipped with ride-hailing apps and belong to an online transportation network or platform. Other conditions require the taxis to install a GNSS or Global Navigation Satellite System receiver, a CCTV with a recording capacity of 72 hours, a dashboard camera and even provide free wi-fi to passengers. Related story: Whatever Happened to the LTFRB's Plan to Push Taxis to Modernize as COndition for Fare Hikes? 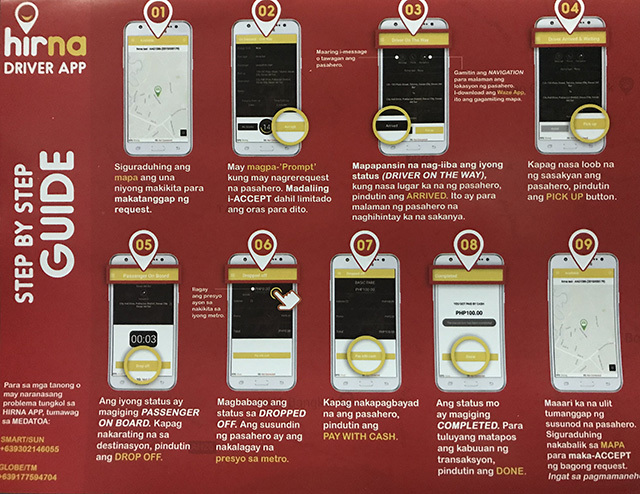 While many Davao taxis have not yet installed the other requirements, at least 4,000 of them are already equipped with the Hirna app, perhaps the most important of the components of the LTFRB’s taxi modernization program. The smartphone or tablet that runs the Hirna app can also serve as GPS device and can be used to provide free Wi-Fi service by turning on the personal hotspot option. In contrast, the taxi modernization program has yet to begin in Metro Manila and most other cities. Most taxis in the National Capital Region have yet to install ride-hailing apps and sign up with a transport network or platform. At the same time, the LTFRB has not yet announced a deadline for taxi operators in Metro Manila to comply with the terms of the modernization plan. It has, however, accredited a taxi-hailing company, Micab, to operate in Metro Manila. The Hirna app is aimed at benefiting multiple stakeholders. For consumers, the app can offer added reliability, safety and convenience. Also, when the app was launched, “Hirna referred to pioneering app registrants like myself as co-founders. We were promised priority bookings and other rewards,” shares Sapasap. For drivers, it helps them to be compliant with LTFRB’s modernization program. For taxi operators, it helps to record transactions and monitor the driver and passenger experience. The co-founders of Hirna encourage Davao passengers to book via the app so that their rides are tracked and the data gathered can inform the local government of unmet riding experience needs. As of April, the fully operational version of Hirna is available for download at Google Play Store and Apple Store. This story was edited on Wednesday, July 4 to correct the name of one of Hirna's co-founders Sherwin Chu. It initially stated Stephen Chu. We apologize for this error.